Will she raise or will she not? As financial markets focus on whether we will see a Fed rate hike this week, investors may be in for a rude awakening. Why do we care about the Fed? We care about the Federal Reserve (Fed) because it controls short-term interest rates and the underlying money supply that’s available to the banking system. What the Fed does with these controls has implications to the credit (the ease and cost of borrowing money) that is available to the broader economy (for corporate loans, household mortgages, etc.). What is the Fed’s job? Most central banks have a single mandate to keep inflation low and stable. The Fed, under former Fed Chair Bernanke’s leadership, has adopted an explicit 2% inflation target. In addition, Congress bestowed upon the Fed the mandate to maximize employment. And, because it appears so convenient for Congress to outsource seemingly everything to the Fed, it now has the responsibility to also provide financial stability. What has the Fed achieved? ... a risk premium is the minimum amount of money by which the expected return on a risky asset must exceed the known return on a risk-free asset in order to induce an individual to hold the risky asset rather than the risk-free asset. Let’s try this again: when risk premia are compressed, risky assets are not expected to provide much additional return compared to a "risk-free" asset. This is noticeable, for example, in the low yield spread between junk bonds and U.S. Treasuries (i.e. the risk premium). Central banks around the world have attempted to stimulate their economies through lowering short-term interest rates and engaging in “quantitative easing,” with the goal of making it easier and cheaper for corporations and households to borrow and spend money (the source of economic growth according to theory followed by many academics and policy makers). This theory is questionable at best and there may always be unintended consequences. Lower interest rates have lead to yield chasing in riskier assets and provided justification for high equity valuations on the back of a low discount rate in fundamental models. Meanwhile, there may be relatively little borrowing for purposes of productive projects that create goods and services with real underlying consumer demand. While default risk may arguably be lower when borrowing costs are rather low, it also means bad businesses survive when the economy as a whole might be better off with employees working for more productive enterprises instead. In this context, economist Murray Rothbard has quoted former German Reichsbank President Schacht as saying, "Don't give me a low [interest] rate. Give me a true rate. Give me a true rate, and then I shall know how to keep my house in order." Investors need to care because the above is just a proxy for all risky assets, including what is sometimes referred to the ultimate risk asset, the stock market. All else equal, economic theory suggests that when volatility (risk premia) is lower, asset prices are higher. Investors are more willing to pay for an asset when the future appears less uncertain. As volatility increases, for whatever reason, asset prices should tend adjust lower to provide the higher expected future return needed to compensate the investor for the increased risk level. Stock prices were rising on the backdrop of low volatility. Such an environment, in our assessment, fosters complacency: investors have been lured, courtesy of the Fed, to buy the stock market. The trouble is that risky assets are, well, still risky. So while central bankers can mask risk, they cannot eliminate it. As a result, our analysis suggests many investors may be holding assets that are riskier than they think. The Fed’s hope was that the economy would be on sound enough footing by now, so that the ‘extraordinary accommodation’ can be removed. Alas, hope is not a plan. In our assessment, the Fed has tried to boost economic growth through asset price inflation. While we don’t think printing money creates jobs in the long-run, it does impact various sectors of the economy and, well, asset prices. Housing, for example, is affected by monetary policy: as home prices rise, fewer home-owners are “under water” in their mortgage (there are more implications, such as rather hot housing markets in places such as San Francisco). Relevant to this discussion, though, is that if asset prices were to deflate, there might be higher headwinds to economic growth than had asset prices not previously been artificially boosted. And that’s exactly where we are: in our analysis, the reason the markets are so nervous about a rate hike is because it signals a shift towards rising risk premia. As the Fed is trying to engineer an exit, risky assets, from junk bonds to stocks, warrant a higher risk premium. In our analysis, all else equal, we don’t even need a Fed “exit:” even a perceived Fed exit warrants higher volatility and, with it, lower asset prices. Differently said, rather then the glass being half full, it may be half empty. Rather than buy the dips, investors may now sell the rallies. Investors may scramble to preserve their paper profits. It will take a while for most investors to embrace this new regime, but we believe the tide may well have shifted. So will we get a rate hike? The Committee currently anticipates that, even after employment and inflation are near mandate-consistent levels, economic conditions may, for some time, warrant keeping the target federal funds rate below levels the Committee views as normal in the longer run. To us, this is a promise to be "behind the curve," i.e. 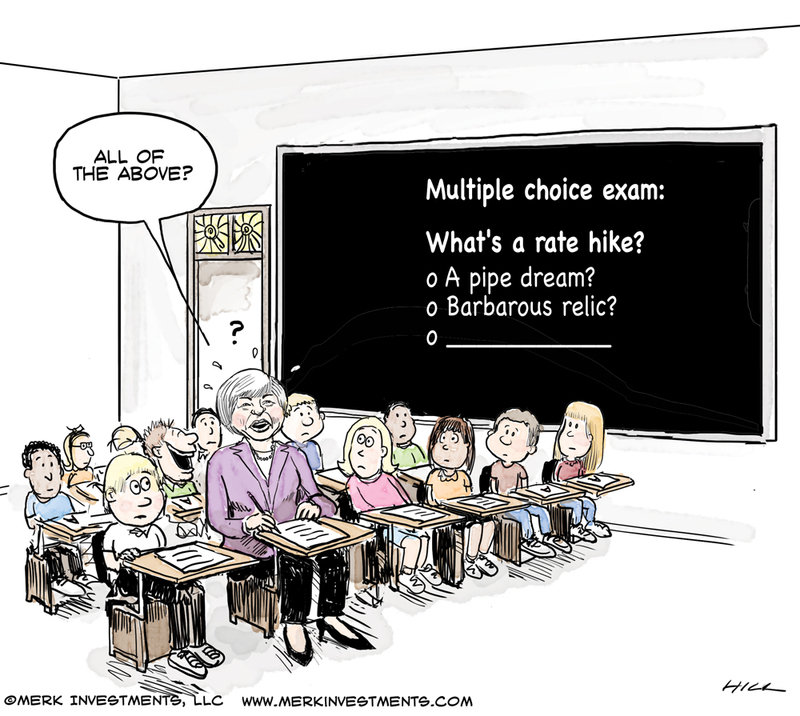 to be late in raising rates. The Fed will try to keep rates lower than the Fed itself ‘views as normal.’ Presumably, it will try to avoid risk premia to blow out too much too quickly. Maybe they’ll succeed, but I would not want to bet my house on it. Just as with every bubble that has been built, investors have been most reluctant to take chips off the table when times were good. We urge all investors to have a close look at whether they are comfortable with the risk profile of their portfolio. Based on our discussions with both retail and professional investors we believe many are over-exposed to risky assets. We don’t expect everyone to do what I did in early August, which is to actually go short the market (please read: Coming Out - As a Bear! ), but we urge everyone to do some serious stress testing on his or her portfolio. Which asset classes do we think will outperform? In August, any trade that appeared to have worked, went into reverse. In fact, one could argue there is no such thing as a risk free asset anymore, and given that risky assets were in decline, most investors lost money. It’s one reason why looking at alternative strategies, such long/short strategies (in currencies, equities or otherwise) might be worth considering. The so-called "flight to safety" did not benefit the greenback; instead, the euro surged on days when U.S. equities plunged. While the media was highlighting how some emerging market currencies plunged, the greenback was down versus all major currencies on numerous days when the S&P was down sharply. We are not suggesting that the euro, or any one currency, will necessarily, be the bastion of strength. Instead, what’s been happening is that investors had been piling in to the same trades, such as “the dollar must rally because the U.S. has the cleaner shirt, will raise rates, because ...” well, a good trade works even better with leverage; except that when "risk is off," i.e. when the pessimists take over, de-leveraging is the mode du jour. As such, all those out of favor investors are suddenly outperforming. In our assessment, different asset classes adjust at different speeds. The currency markets, when it comes to free-floating currencies at least, adjust faster than equity markets. In the equity market, we expect downward pressure to persist for an extended period until public sentiment is firmly in bearish territory (this may take months, more likely years). And just before anyone thinks that bonds must do well when equities do poorly, remember that both have at times risen simultaneously; as such, it’s perfectly possible for both stocks and bonds to decline. What about gold? Gold in the long-run has a near zero correlation to equities. It’s out of favor with many investors and if we are right, the Fed will intentionally be “behind the curve.” The reason for the Fed intentionally being late, by the way, has to do with the credit bust with 2008: Bernanke used to argue that when faced with a credit bust, one of the biggest policy mistakes would be to raise rates too early. Our interpretation: the Fed wants to err on the side of inflation. Add to that that we think that neither the U.S., the Eurozone, nor Japan can afford positive real interest rates in a decade from now, and we think investors should evaluate whether gold may add valuable diversification to their portfolio. I would like to caution, though, that I once had a discussion with an FOMC member who told me the scenario above is unrealistic because it wouldn’t provide a stable equilibrium. My response was: I never said it would be stable! Years earlier, I talked to a former high-ranking FOMC member who had retired a few months before. I mentioned to him my concern that the increasing debt in the system would make the FOMC less flexible, as small moves would have an amplified impact. He also brushed off my concern, suggesting the Fed could always fine-tune its policy. We may have seen some of this “fine tuning” in recent weeks, with Fed officials stepping away from rate hiking plans whenever the markets throw a tantrum. To continue this discussion, please register to join us for our Webinar entitled "#crash or #happilyEverAfter?" this Thursday, September 17. If you haven’t already done so, ensure you don’t miss it by signing up to receive Merk Insights. If you believe this analysis might be of value to your friends, please share it with them.